Welcome to our beach home - Breath of Heaven! 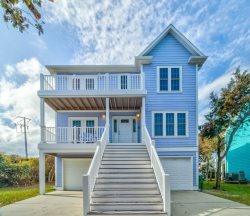 This is a 4 bed, 3.5 bath home that sleeps 10 and has room for 6 cars! We are only a short 3 minute walk to the beach which is right across the street. Walk into the open floor plan: large living room with sectional seating and a wall mounted flat screen tv. Proceed into the dining area with seating for 6 at the table and 4 more at the bar. The kitchen is fully equipped with everything you'll need except your food. Next to it is the laundry area with a full size washer and dryer and a half bath. Step outside onto a private porch amid the Live Oak trees. Also downstairs is the first of two master suites. It has a king size bed and tv as well as a spacious bathroom with dual sinks, jetted tub and separate stall shower. Upstairs is three more bedrooms and two full baths. The second master suite has a queen bed and it's own full bathroom. The upstairs porch off the master has the best view of the ocean. Grab a cold drink and sit out enjoying the view. The third bedroom has a queen bed and the fourth bedroom has bunk beds - full on bottom and twin on top. There is also a roll away twin bed if needed. Parking is a breeze with plenty of space for up to six cars in the 2 car garage and wide driveway. Store your beach gear, golf cart, and bikes in the garage. The beach access is across the street, a 3 minute walk. Our second time using A1 for our beach trip. Definitely recommend! More than enough space to spread out and lots of parking! Members of the team were amazing. They responded quickly to my calls and helped ensure we had all we needed to make our stay comfortable. I liked the location of the property. It was a 1-2 minute walk from the beach and less than 5 minutes from the pier. The property itself was spacious and the open layout of the kitchen and living room was ideal. We liked the master suite on the main level. The decks and balconies were an added bonus.